Firstly we must look at the Stark motto: "Winter is Coming". This is a very strange motto - the other Houses have mottos which boast of their strength, such as the Lannister's "Hear Me Roar!" and House Baratheon's "Ours is the Fury!". In fact, House Stark is the only House whose motto speaks not of their own power, but an external threat. Or does it? 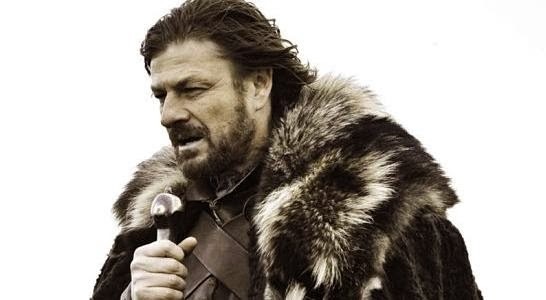 Could "Winter is Coming" actually be a warning as to the power of House Stark? It would certainly fit far better with the other House mottos. The Stark home of Winterfell is a strange, mysterious place, and in 'A Dance With Dragons' the story hints that the winter is coming not from the north, but from Winterfell itself. At the Wall, characters talk about how the winter wind is coming from the south. We also see the winter encroach across the Riverlands and towards King's Landing, showing that it is travelling southwards. So winter is emanating from a central spot - a spot where Winterfell is. The idea that "There must always be a Stark in Winterfell" is one that is constantly repeated. Can it be any coincidence that when the Starks left, winter began? And what of the terrifying Winterfell crypts, where the Starks store the bones of their dead? All the dead bodies are armed with swords - which is useless for a corpse, until you remember that the White Walkers are able to reanimate the dead. And what better than an undead army which is already armed? With the above evidence, the Starks can be seen to be allied with the White Walkers, perhaps even controlling them in some way? The Starks already led two uprisings against the lawful kings of the day in recent years, there is nothing stopping them from leading an uprising against mankind. As a final piece of evidence, consider the scene where Ned Stark has his leg broken. The physicians talk of his broken bone - proof that inside Ned Stark hides a terrifying skeleton! And we know that the White Walkers have skeleton servants. The last we heard, Ned Stark's bones were on their way to Winterfell. Who knows what terrors they will unleash once they arrive?